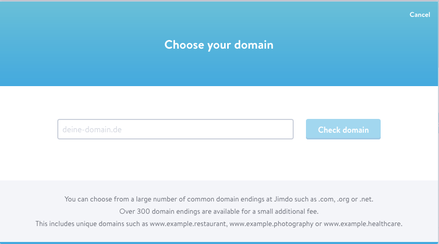 If you’d like a different extension for your domain, you can purchase it as a Premium Domain through Jimdo, which will cost a little extra. Check out the full list of available domains on our Prices at Jimdo page. If you already own your domain name, you can skip the steps here and go straight to Using an Existing Domain. Once you’ve decided on a domain to use with your website, open the Menu and navigate to Settings > Domains & Email > Domains to add your domain under "Add a New Domain." When you click on 'Add a New Domain', you'll see two options. You can either register a new domain or connect a domain. 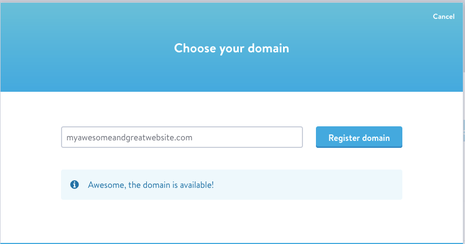 To register a new domain, click on the first option. You can then check the availability of the domain that you'd like to have. If it's available, you'll be taken to the next step. If it's already in use, you'll be asked to enter another domain. 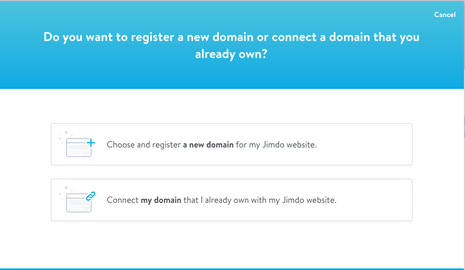 If you're entering a domain that you've already registered with another domain registrar, you'll be asked to either connect your domain or transfer it over to your Jimdo site. After checking the availability of the domain that you've chosen, click on 'Register Domain' to go to the Domain Registration Form. 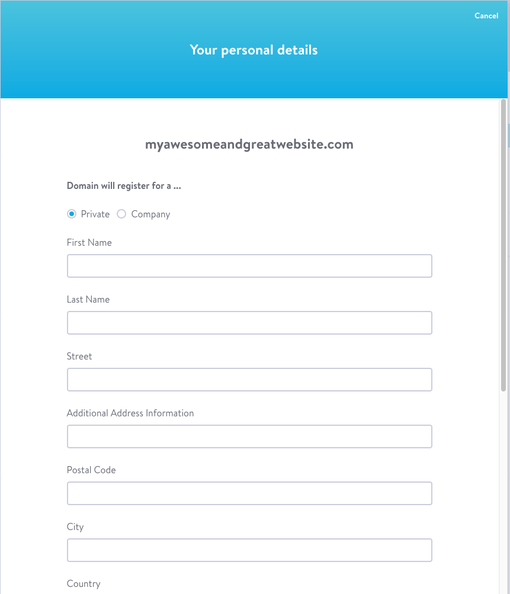 Fill out the form and check the "Do not display my information in domain owner database (WHOIS)" box if you wish to keep your contact details from being published in the WHOIS database. Then, submit your registration. After a couple of minutes, we'll send you an email to the address you entered in the Domain Registration Form. Open the email, double-check your details and confirm the domain registration via the confirmation link. Your domain will become active shortly thereafter. If you notice any errors in your domain details, such as typos in the domain name or incorrectly entered contact info, make sure to get in touch with our Support Team before confirming your registration. Change your mind? Find a typo? If you want to change your domain after confirming it, additional fees will apply for a domain change. The fee for a domain change is listed on our Prices at Jimdo page. You can also request a domain change if your business name has changed or you’ve simply changed your mind about which address you’d like to use for your Jimdo website. Please contact our Support Team to request a domain change. Connect an externally registered domain to your site at no additional cost. Register an additional domain through Jimdo at the price listed on our Prices at Jimdo page. To do that, log in to your Jimdo website, open the Menu and go to Settings > Domains & Email > Domains and add your new domain under "Add a New Domain." Confirm your order in the next step and complete the registration for your new domain following the instructions above.